Following feedback from Clean Glasgow Neighbourhood Improvement Volunteers involved in local clean up events, a proposal to enhance the site came about in summer 2011. The land is owned by the Glasgow Housing Association (GHA), and they have been working in partnership with Glasgow Community and Safety Services (GCSS) and local community groups to take forward the plan to regenerate the site. The GHA have funding available in order to transform the site from its current neglected condition into a usable and attractive green space, for the whole community to enjoy, free of dog-fouling and litter. 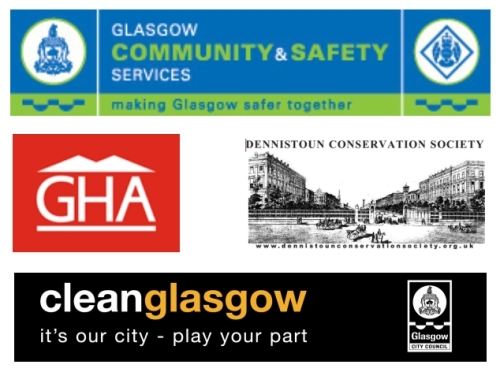 A GHA/GCSS led community consultation taking place on a drop-in basis between 4pm and 8pm on Thursday 16th February at GHA (Keystone Housing Association) offices, City Park, 368 Alexandra Parade, Dennistoun, Glasgow, G31 3AU. Drop in any time. Tea and coffee will be available. Plans of the proposed development will be displayed, and representatives of GHA and contractors will be available to respond to queries. You are encouraged to come along to the community consultation and share your thoughts on the development. For more information about the consultation event please contact Thomas Paterson, Development Officer (East Locality), Environmental Community Action Team, GCSS via Thomas.Paterson@glasgow.gov.uk or on 0141 276 7448. The poster for the consultation can be viewed by clicking here (PDF).